First things first. 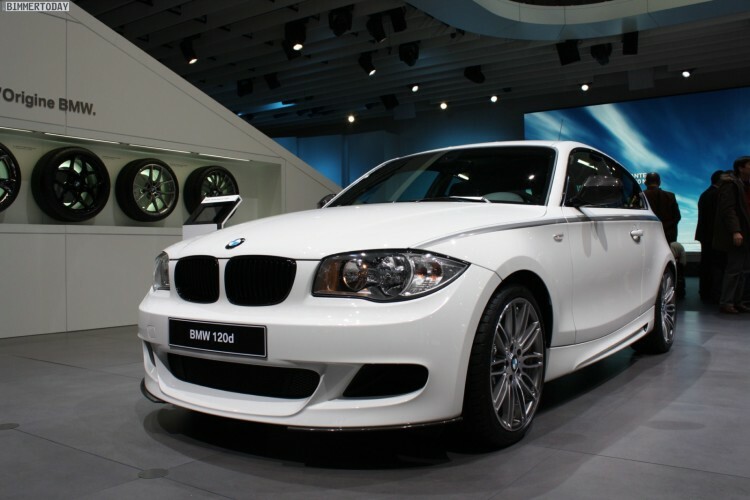 The 1 Series Hatchback has been a personal favorite for years now and many times express my opinion publicly on why BMW should bring this car to the United States. Rumors of a hatch coming across the ocean have been going around for years, but BMW has yet to communicate anything official. With the new 1 Series Hatchback just around the corner, the speculations are starting to pour in again. At the same time, our hopes go high again. And after seeing these photos of the current generation 1 Series hatch with BMW Performance Parts, our regrets are even bigger. Despite having a nearly 7 years old design, the 120d BMW Performance is a little mean looking car. As always, BMW showcases their performance parts equipped vehicles in the usual Alpine White color, fitted with numerous carbon-fiber components and stripes. At the front, the 120d gets the blacked-out kidney grille, a more aggressive front apron and carbon-fiber caps on the side mirrors. At the back, a new rear-bumper and a very dynamic-looking rear-wing made out of carbon. Inside, the sportiness look is enhanced by the bucket seats, sports steering wheel with Alcantara trim and on-wheel LCD display, as well as plenty of carbon-fiber parts for the extra sporty flair. We also see the holder for the Apple iPhone which is using the Application link to the BMW infotainment system and represents an interesting alternative to more expensive navigation system. Now, here is to hope that the next generation 1 Series will make its way onto the U.S. market with one of the hatchbacks bodystyle as well. Previous post Video Teaser: BMW M5 Winter Test Drive – Register for a test drive!